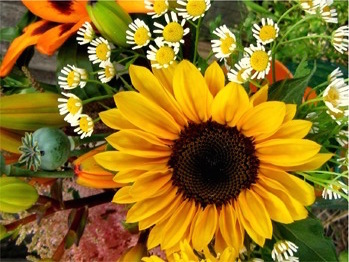 Treat yourself to a weekly bouquet of summer blooms from StrayCat Flower Farm! Each bouquet will feature 12 stems in a tasteful, thoughtful, and visually interesting arrangement. Each week will showcase a variety of the freshest flowers in season, featuring a balanced combination of focal blooms, filler blossoms, and green foliage. Focal blooms will include sunflowers, zinnias, phlox, and more. Filler blooms will include cosmos, dianthus, and nigella, and others. Foliage will include mint, rosemary, geranium, and other greens foraged in the Intervale. Your 12-stem bouquet is the perfect size to fill a mason jar, and will be delivered in a plastic sleeve that will hold water to keep your flowers fresh in transit. This subscription is unique to the Intervale Food Hub, and was specially designed for us by Diana Doll of Stray Cat Flower Farm. These bouquets offer a great value for their size - not to mention the care that's put into each handmade arrangement for you each week! StrayCat Flower farm specializes in organically grown flowers on a two acre farm in Burlington's Intervale. Stray Cat Flower Farm has been in production for nearly 30 years! Owner Diana Doll and her crew bring color and joy to the world with their beautiful flower arrangements. You'll be surprised and delighted every week!